Great brands tell great stories. It’s this unique ability to communicate their ‘why’ that forms the foundation to their success and longevity. In today’s consumer driven society, customer loyalty leaves a lot to be desired. One minute we’re shopping at Tesco, the next, we’re walking through the doors and filling our trollies in Aldi. It’s a dog eat dog world, and one which unfortunately leaves a lot of retailers behind. For example; in 2018 we said goodbye to our childhood favourite Toys ‘R’ Us, and Maplin too – who were previously one of the UK’s market-leading electrical brands. Well considering consumer spending has dropped by 0.7 per cent this year, it’s now time for brands to stand up and engage with their customers. For me, this is why these stores (listed above) fell by the weigh side. They ultimately failed to connect with their audience, and give the consumer what they expect in this day ’n’ age. As social creatures, us modern day adults want to feel special, to feel part of a club, and to be given an experience like never before. It’s for this reason why brands have to communicate their story and trigger that all important ‘gut reaction’ when making that buying decision. As designers, we play a vital role in helping brands to, first of all, understand their purpose and find their all important why. Why do they get up in the morning? Why do they do what they do? Why, why, why! Once understood, we can then begin to tell that all important story. For me a brand’s story is the single most important piece of information, and should never be overlooked. 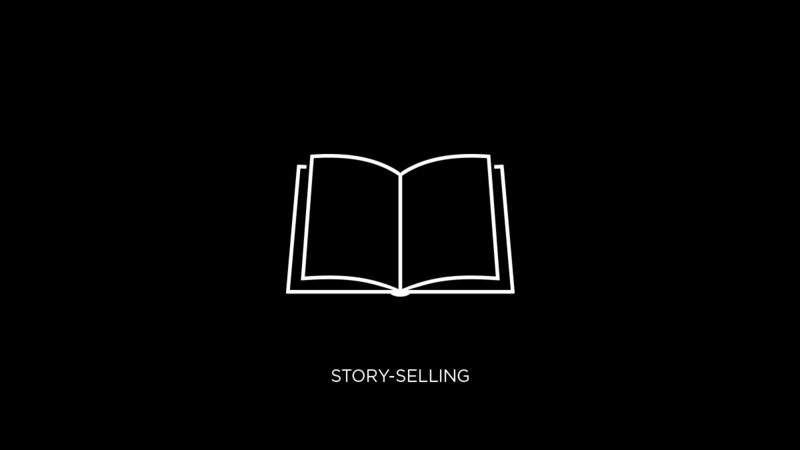 The power of storytelling will ultimately connect with the consumer and subconsciously engage with them leading to a greater chance of loyalty to that particular brand – story-selling. All the decisions we make start from the top and by the top, I mean the brain. But our brains become a brands enemy. The brain is where we make the majority of our decisions, but these are almost always – rational decisions. ‘Shall I buy this? Hmm… let me think about it… Naa I can do without it.’ It’s very rare we will make an impulsive decision when the brain gets involved. That’s why story telling needs to work much harder and engage these four areas. We then move down to the sense’s – how does it look visually? How does it smell? Can I taste it? Now we’re doing better and we’re more likely to engage. When we bring the heart into the mix, the brands story is really gathering traction and doing its job. We now feel warm and at ease with the brand – we LOVE this brand and can’t be without it. It makes us feel good to hold its products. Their store appeals to all of our senses, as we buy into the experience they provide. However, non of these are as important as the fourth – a ‘gut reaction’. It is the most powerful part of the human body that kicks in when we make decisions. When the gut kicks in, all rational thinking goes out of the window and we just have to have it, and ultimately give our lives to that brand. If a brand can hit the gut then they’ve ticked all the boxes – and welcome a new customer to their club. Take Apple, Beats or Spotify for example. Here we see great brands telling great stories on multiple levels. We trust them and feel loyal to them because we believe in them. I can’t remember the last time I followed my brains decision when it comes to upgrading my mobile. I’m as loyal as they come to the iPhone – even though there’s far better on the market. When working with brands, it’s easy to give them a nice logo, or beautiful pieces of visual communication. Us designers get great pleasure from making something look aesthetically pleasing, which for me is highly rewarding – however, this is not how the project should begin. This is not the starting point. You start at the bottom, the depths if you like – the story. Once you’ve grasped this, the aesthetics follow. The aesthetics become the shop front to the goods that lie inside. A great brand story is what’s gets the goods in the first place, and what keeps them there. The next time you look at a brand let’s not overlook the importance of their story. And always, trust your gut.